Family cars and estates | What Car? 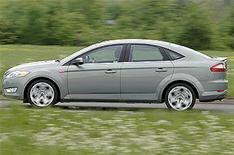 Ford Mondeo Haggle hard for deals on new Mondeos. The best price we were quoted was 17,580 for a 2.0 petrol Titanium hatchback. That's a saving of 2940. Renault Laguna Internet broker Perrys.co.uk will give you a whopping 5041 off a 2.0 140 Dynamique hatchback. You'll pay just 11,999. Honda Accord Internet broker Drivethedeal.com will sell you a 2.2 i-DTEC EX GT for 24,009. That's a saving of 2241 on the list price. Jaguar X-type There are great deals to be had on X-type estates. Our mystery shoppers haggled a price of 24,584 on the 2.2D SE a saving of more than 4000. Peugeot 307 Four years' 0% APR hire purchase is available on estate and SW models if you put down 25% up front. The offer will save you more than 157 per 1000 borrowed.